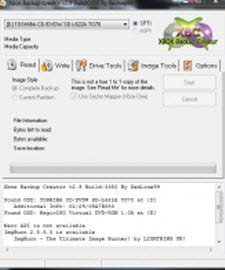 Redline99 has made some updates to the Xbox Backup Creator bringin this release to v2.9.0.350.A The updates coincide with the topology data within the firmware.A To set this up follow the steps below so to use the topology data..
"Click on the 'Image Tools' tab and select the 'Inject' radio button. Load the image file that you want to patch. Click on the 'AP25 Sector' button. Select the necessary .bin file according to the game you're patching. Save the image and burn using a Liteon iHas drive flashed with the iXtreme Burner MAX firmware."